CSI will be closed for voice communication on Friday, April 13th for the Good Friday holiday. Although U.S. exchanges will be closed, the CSI host computer will be accessible as usual. Those markets that remain open will be available for updates at their normal posting times. Today's stock market investor, disappointed that the market may be reaching for new lows, might reasonably ask how low the market can go. Still another question that comes to mind when reflecting upon stinging market losses is, "Who benefits when the market drops?" Unfortunately, the answers to these questions could be zero and no one. The stock market is supported by such fundamental factors as corporate earnings, technological promise, licenses, patents, intellectual property rights, competition, etc. If the investing public considers such factors to be unimportant, the price of a given security can drop in an endless spiral benefiting no one. Of course, you might say the short seller would benefit. This is true only because the short seller might have borrowed the shares he sold short. Those shares, whether owned or borrowed, would also be worth less as the market dropped. For any single stock in the stock market, either all holders of record win or all holders lose simultaneously as a given stock goes through its oscillating movement. On the other hand, the futures market, which many perceive to be very risky, does not possess the same characteristic structure. Whenever a futures trader engages in a long or short position at a given price, whether it is pork bellies or bottle caps, the buyer's profit will always become the seller's loss and vice versa. One party or the other will win while the other loses by precisely the same amount (less commission). In the futures market, half the players win while the other half simultaneously lose. The dynamics of this for the futures arena are reflected in the open interest reported by the exchanges each day. For every count of the open interest, there will be one party who is long (a buyer) and another who is short (the seller). Each count of the open interest represents a party of two who are on opposite sides of the trade wherein any gain by one is a loss by the other. There exist other advantages and disadvantages in terms of investment costs for stocks and futures. Futures trading offers the trader an interest-free margin expense when he advances a margin deposit of 5% to 10% of product value. This relatively low deposit is predicated upon the security required by the broker to cover the cost of an adverse market reaction against the trader for a short period of time. The "free" ride on the margin interest expense is based upon the reality that there is no actual (as opposed to future) product upon which to assess the cost. By definition, the futures product does not currently exist and will only develop into an actual when the futures contract reaches its future delivery date. This is also why the futures transaction is considered to be a contract that describes the specs, timing and other conditions, etc. about the product. Stock margin, on the other hand, is levied on the real shares in the transaction and is charged at nominal market rates. It is typically charged against 50% of the stock's full transaction value. Futures market closing prices have the advantage that they are "settled" by exchange officials who incorporate judgment to decide where a given market should close or would have closed, had there been adequate liquidity right up to the closing bell. Adjacent deliveries for more liquid contracts can influence the would-be price where a further distant contract in the same market would likely close if trading had been active through the closing bell. A stock's closing price, on the other hand, is simply the last price reported before the sound of the closing bell is heard. This could misstate or misrepresent what the market might have reported had there been adequate liquidity and volume at the close. It is interesting to note that in this world of technological innovation, there is now a definite workable connection between the stock and futures markets. For example, one might easily take a position in stock index futures for the S&P 500 stock index. In this situation, the rules of the futures market prevail because the focus is on the future price, not necessarily the market price of the given stock index. 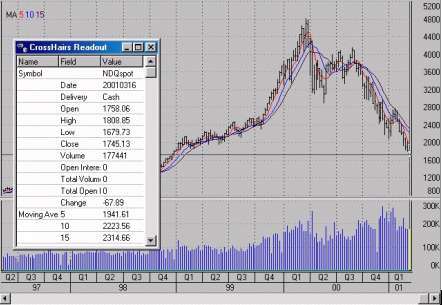 The S&P 500 futures have been in a decidedly bearish posture since August of 2000. According to the CFTC's Commitments of Traders early March 2001 report (which is available in graphic form bi-weekly through Unfair Advantage compliments of the Bullish Review), the S&P 500 futures remain bearish with commercial interests leading the market downward. At about the time I was composing this newsletter, I also heard a radio analyst report that the broadening scope of market losers indicated that the bear market is nearing its end. Who knows where the stock market is headed? 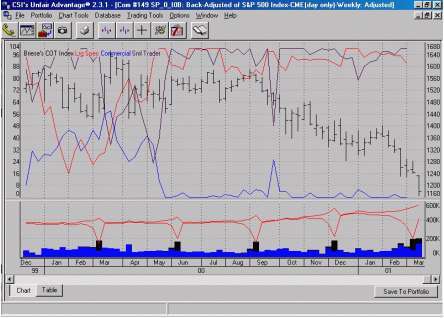 Here at CSI, we provide data and software in both the stock and futures trading arenas. With the stock market's prolonged precipitous drop, commodity traders have recently outnumbered stock traders. The fact that every position taken in the futures market is balanced with a long and a short position on opposing sides is likely the reason behind this more or less consistent stability. It tends to minimize the trauma of the recent stock market decline. I don't claim to know how long the current market trend will prevail. Only one thing is certain amid all this uncertainty: Who benefits when the stock market rises? Almost all stock market investors, and the holders of exactly half the stock index contracts. Here's hoping that the stock market will quickly rebound and that, by the time you read this, new highs will be on the horizon. I look forward to the day when the unbalanced stock market tips its scales in favor of the investor. But while we wait, don't discount the potential value of futures (and options) for protecting and supporting your investment interests. For more information on the biweekly CFTC report, please see Steve Briese's Bullish Review. Contact Steve at (888-423-4950) or their website www.BullishReview.com.